The Govt legislative as well as administrative measures to reduce logistics related hurdles for boosting domestic and global trade. The Govt is taking legislative as well as administrative measures for an integrated strategy to reduce logistics related hurdles for boosting domestic and global trade, Commerce Minister Suresh Prabhu said today. High cost of logistics impacts competitiveness and movement of goods, he said. The Indian logistics industry is estimated at around USD 215 billion, which is growing at over 10 per cent annually. “We have to increase our share in global trade and logistics plays a very important role in that,” Prabhu said while launching a logo for India Logistics. The logo was designed by the National Institute of Design.Prabhu that the ministry is developing a national logistics portal as a single window market place to link all stakeholders, and preparing an integrated strategy to reduce cost of exports, imports and domestic trade. “We are taking help of best experts of the world for this. We are also moving to take legislative as well as administrative step to improve our logistics related things,” he added. 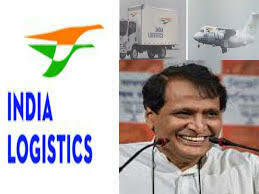 Prabhu said billions of dollars of investments are required to improve logistics sector. The Department of Logistics, under the ministry, also inked a memorandum of understanding with Indian institute of Foreign Trade (IIFT) to set up a center for logistics here.